High intensity interval training (HIIT) allows you to get a lot done in a short amount of time. These quick and effective workouts can slide seamlessly into your schedule, so there’s no excuse not to complete this 30-day HIIT workout challenge. Each day for one month, you’ll be doing a different workout, comprised of bodyweight movements, weights, running, plyometrics and other forms of cardio and strength. The key here is to work hard for a short amount of time. Keep up the intensity and don’t skip a single day. You’ll be amazed at what you can accomplish in 30 days. Push-ups are bodyweight exercises that work the chest muscles. To complete this workout, perform five push-ups and rest for 30 seconds. Add five push-ups to each round until you make it up to 20 pushups. When you reach 20, work your way back down in increments of five push=ups. As you get better, you’ll be able to increase your pushup threshold. Sprints are a quick way to up your heart rate. Find an open space or treadmill and warm up at a light jog for five minutes. When you’re ready to go, find a challenging sprint pace and run for 30 seconds. You shouldn’t be able to hold a conversation at a sprint pace. Take the speed down and walk for one minute. Complete six to eight cycles of this pattern. Do 10 push-ups, then hold a plank for 30 seconds. Finish the set with 30 triceps dips. Repeat this cycle six to eight times through to strengthen your arms. 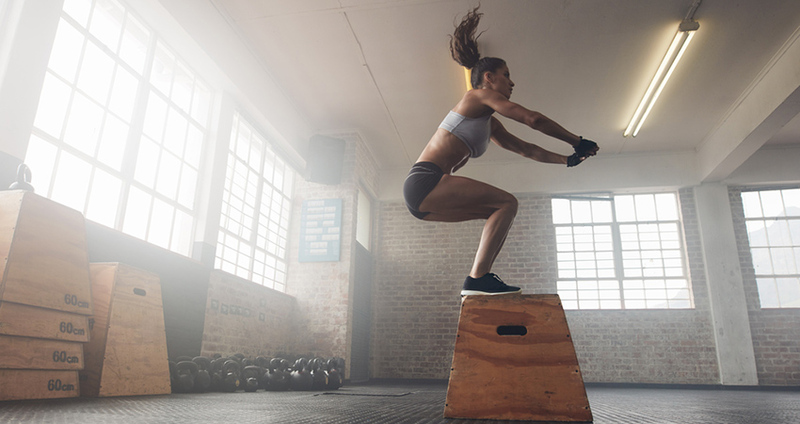 To complete the jumping HIIT workout, you’ll need to find an open space where you can complete broad jumps. Perform 10 broad jumps, followed by 10 frog jumps, and 50 jumping jacks. Rest and repeat. Set your timer for 10 minutes and complete as many rounds as you can in the allotted time. exercises in order: front plank, left side plank, right side plank and Superman. If you’ve got 16 minutes to spare, try squeezing in this cardio workout to get a quick sweat session in. Run for five minutes at an easy pace, walk quickly for one minute, perform high knees in place for one minute, and walk quickly for one minute. Repeat this sequence twice! Use this workout to strengthen every muscle in your body with intense exercise. You’ll complete 20 squats, 10 push-ups, 20 lunges (alternating), and 10 pull-ups. Repeat this sequence with breaks as needed for 12 minutes. Grab a pair of five or eight-pound dumbbells for this full-body workout. Start with 50 squats with dumbbells at your side. Next, complete 40 bent-over rows, 30 walking lunges (walking with dumbbells), 20 overhead triceps extensions and 10 goblet squats. Rest for one minute and repeat one more time. If you’re looking to tone the back of your arms, look no further than this workout. Find a ledge about hip-height to do triceps dips off of. Set a timer for one minute. Complete as many triceps dips as you can in the allotted time. Rest 30 seconds and repeat again. Complete five minutes of triceps dips. If you want more of a challenge, add more rounds or decrease your resting time. Everyone loves a good burpee workout, right? Burpees are the perfect full-body exercise, so they’re an excellent exercise to have in your arsenal. This workout is simple, but very effective. Complete sets of 10 burpees with a 30-second rest break between each set. Finish 10 sets for a total of 100 burpees. Find a box that’s high enough to provide you a challenging jumping surface. Complete box jumps for 30 seconds and rest for 30 seconds. Next, complete box jumps for one minute and rest for one minute. Complete this pattern until you reach two minutes of box jumps and two minutes of rest. From there, work your way back to 30 seconds. Work your core with this HIIT session. Perform a front plank for 30 seconds and recline into child’s pose for 15 seconds. Repeat five to seven times to fire your abs up with a quick workout. Think you can plank for longer? Up your plank time to one minute to really feel the burn. This squat workout is Tabata style. Set your timer for four minutes and work for 20 seconds with 10 seconds of rest for a total of eight rounds. Here’s the exercise lineup: squat jumps, squats with dumbbells at your side (challenging weight), squat pulses, goblet squat (challenging weight), wall sits, squat jumps, bodyweight squats and finish off with dumbbell squats. The stair burnout will tire your legs in minutes. Find a set of stairs with at least 20 steps. Set your timer for one minute and run up and down the stairs as many times as possible. Rest for 30 seconds and repeat for another minute. Complete the workout for a total of 10 minutes of stair running. This is an excellent go-to workout when you don’t have time to make it to the gym. For this workout, perform two Tabatas of bodyweight movements of your choice, whether it be burpees, push-ups, tuck jumps or others. Set your timer for four minutes with 20 seconds of movement and 10 seconds of rest for a total of eight rounds. Perform this Tabata twice. Keep your workouts fun by hitting the great outdoors. (You’ll want to do this workout on a good day with nice weather.) Find a park bench and perform 20 triceps dips. Run over to the monkey bars and climb across as fast as you can. Run back to the bench and perform 10 incline push-ups. Walk back over to the monkey bars and go across and back twice. Run back over to the bench one final time for 10 decline push-ups. This is another nice-day workout that requires you to take your HIIT workout to the park. You won’t need any equipment for this one. Run for one minute, bound or skip for 30 seconds, run for one minute, run backward for 30 seconds, and run for another minute. Take a two-minute break and repeat two more times with rest between the second and third rounds. It’s time to get power walking! Find a friend and go outside for this simple workout. Power walk for five minutes. Stretch for two minutes. Repeat this sequence for an hour. single-leg lifts. Rest for 30 seconds and then take it from the top five more times for a total six rounds. If you’re looking for upper-body burn, look no further! Perform 10 pull-ups and 10 chin-ups. Rest for one minute. Repeat this sequence 10 times. 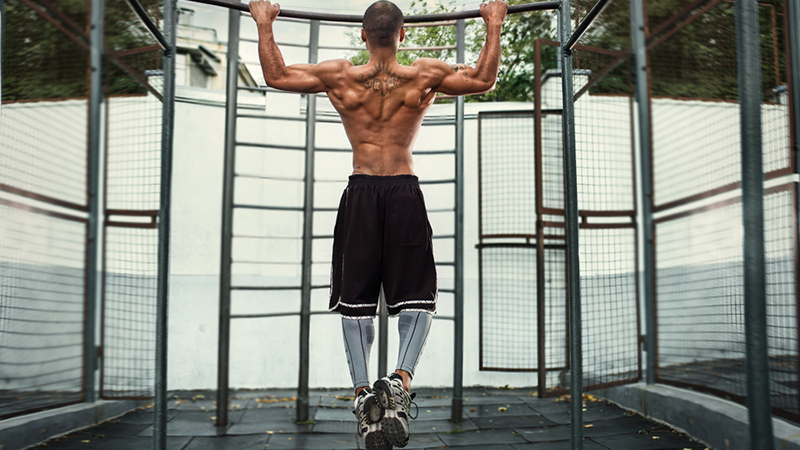 For more of a challenge, decrease the rest period or increase the amount of chin-ups and pull-ups. jog, and end with 50 incline push-ups. This is more of a freestyle HIIT workout. Put on your favourite music and dance it out for five minutes. Stretch for one minute. Go all out and dance for another five minutes and stretch for another minute. Repeat until you reach 30 minutes of dancing. Lunge in every direction to tone your legs. Start with a front left leg lunge, lunge to the left side, reverse lunge on the left side, reverse lunge on the right side, lunge to the right side, and complete a front lunge on the right leg. Keep this lunge circle going for two minutes. Rest for one minute. Complete 10 rounds. Load a barbell with challenging weight that you can hold while you squat for five repetitions. Take a 30-second break. Load a barbell with weight that you can squat for 10 repetitions and complete them. Follow with a 30-second break. Work your way up to 20 repetitions. Grab a friend to complete this workout. Get a medicine ball and perform 10 medicine ball slams. Next, throw it to your partner to complete their medicine ball slams. Perform squat jumps until your partner throws it back. Set the timer for 15 minutes and complete as many rounds as possible. Lie on the floor to get started with this HIIT routine. Perform reverse crunches for one minute. Next, perform one minute of bicycle crunches. For the last move, hold your feet at a 45-degree angle above the ground while you pump your arms up and down for one minute. Go through two cycles before resting for one minute. Complete another two cycles to finish the floor workout. Grab two dumbbells with a weight limit that you can curl for 8 to 12 repetitions. Perform 8 to 12 repetitions of dumbbells curls. Move right into 8 to 12 dumbbell side curls followed by 8 to 12 hammer curls. Perform 10 pull-ups. Rest and repeat five more times. Partner workouts make exercise more fun, which makes it more likely that you’ll stick to a routine. Grab a friend and head to the track. Stand facing each other 50 meters apart. Sprint to your friend. Once you reach your friend, tag them and they’ll sprint to your original spot. Keep this sequence going for 10 minutes. This workout flip-flops between upper and lower body exercises. Perform 50 bodyweight squats followed by 50 push-ups. Rest for two minutes. Perform 50 alternating bodyweight lunges followed up 50 triceps dips. Rest for two minutes and repeat sequence beginning with squats.